Russian artist Vasily Vereshchagin visited India twice in the 19th century. His paintings gave Russians their first glimpse of the people, nature and architecture of India. During a recent visit to Moscow’s Tretyakov State Gallery, I was awestruck by a corner that had images from 19th century India. The stunningly beautiful oil on canvas paintings were the work of Vasily Vereshchagin, a traveler and artist who spent extensive time in India in the 1870s and 80s. The little corner in the Tretyakov gallery has paintings from Bombay, Delhi, Jaipur, Udaipur, Sikkim and Kashmir, as well as some places in what is probably southern India. These paintings were Russia’s first visuals of a country that was always seen as an exotic and culturally rich and diverse land. He only managed to return to India in 1882, when he once again traveled across the country. Bharucha believes Vereshchagin went to southern India before going to Calcutta and then to Darjeeling and Sikkim. Little is known about what happened to these works after the Bolshevik Revolution. One such painting was auctioned off in September 2011 by Sotheby’s. 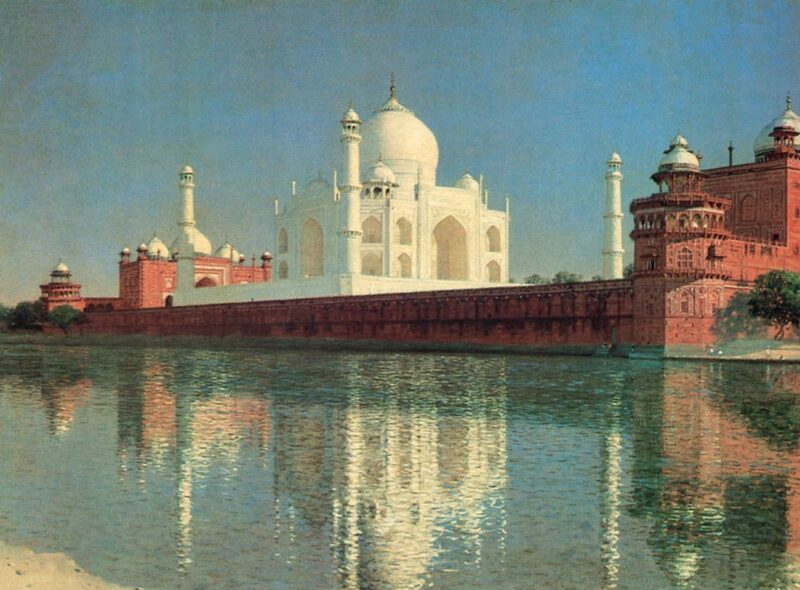 An oil on canvas painting of the Taj Mahal from 1876 was sold for $3.7 million to an anonymous buyer. His work also binds India with the former Soviet republics in Central Asia. Vereshchagin was the first artist to depict the cultural continuity from Central Asia into northern India. The paintings show the similarities in architectural styles in mausoleums and monuments from Samarkand and Bukhara to those around Agra. Vereshchagin’s most famous painting in India is ‘The State Procession of the Prince of Wales into Jaipur.’ This enormous oil on canvas work, which is inside Calcutta’s Victoria Memorial, is the third largest painting in the world. The British may have been pleased with this work but were peeved with a painting of the 1857 Indian War of Independence titled ‘Blowing from Guns in British India,’ which showed Indian soldiers getting executed by being tied to gun barrels. It was the first image to depict the brutality of British rule in India.